Here is the second block for the City Girl Sew Along. This time we will applique the strips of 'lead' to form our stained glass design. The process is simple but the results are cool! 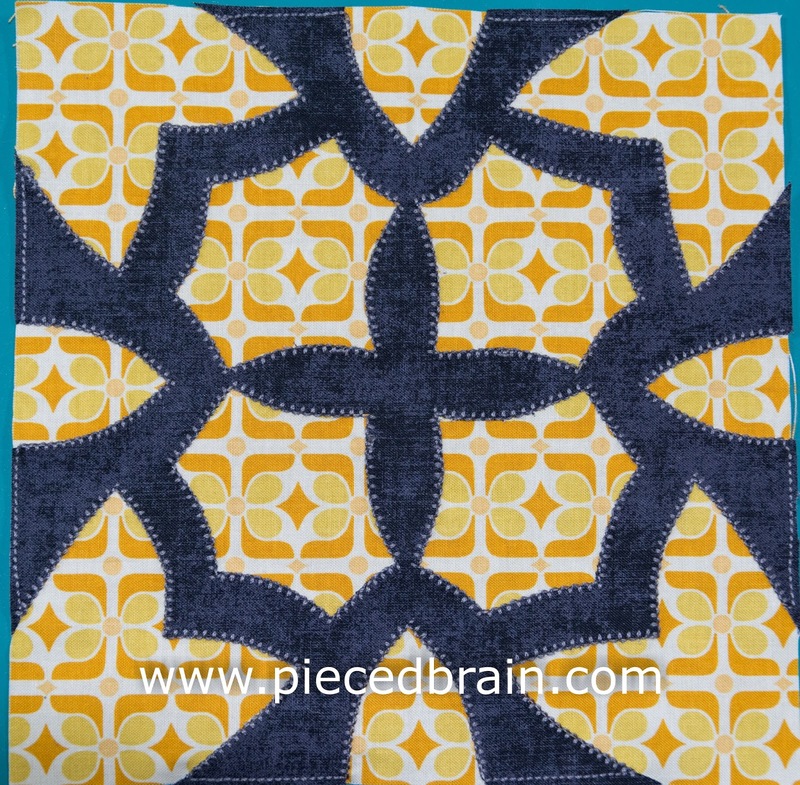 Click here to download the PDF file with the template for Block #2, Cathedral Window. 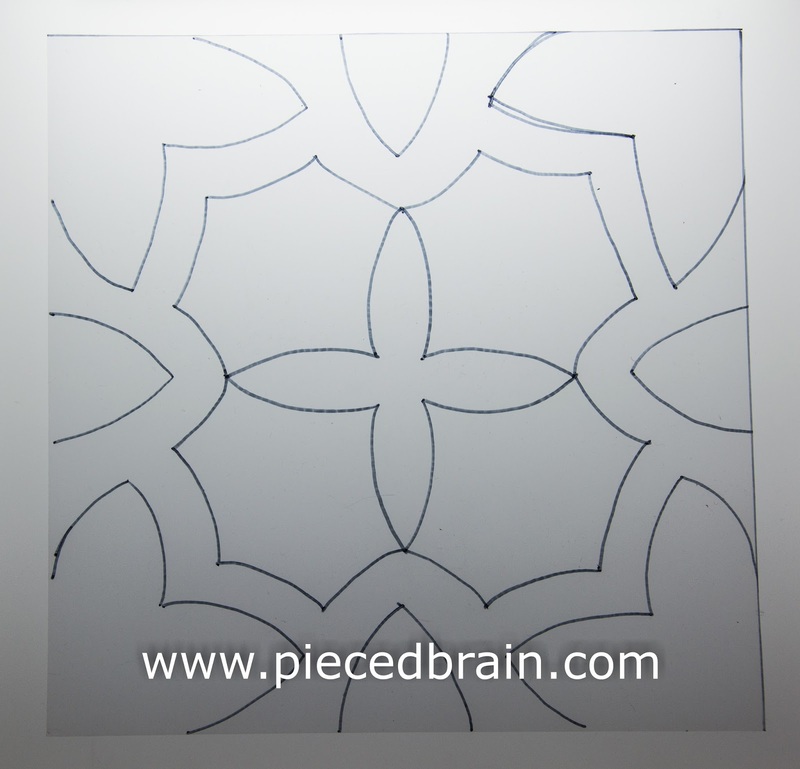 Once you print the design, place template onto your light box as I've done above (or window) and then, you have two choices: (1) trace template directly onto a piece of the fusible web, or (2) trace it onto template plastic - which I usually do if I want to keep template for later use. 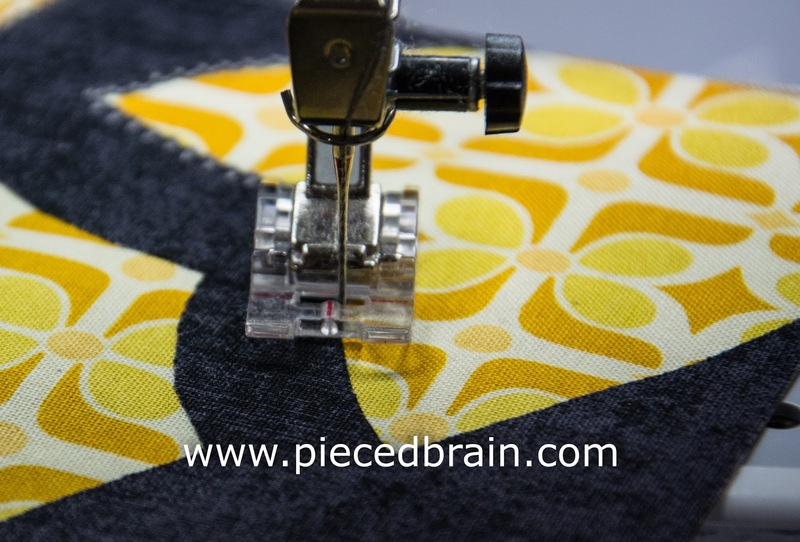 If you choose option 2, after cutting around the lines carefully, trace template onto shiny side of fusible web. I use this product so often that this time I bought the entire bolt at JoAnn! Yes! Place fusible web over wrong side of dark gray fabric, press it as per manufacturer's instructions, and wait until fabric cools down. 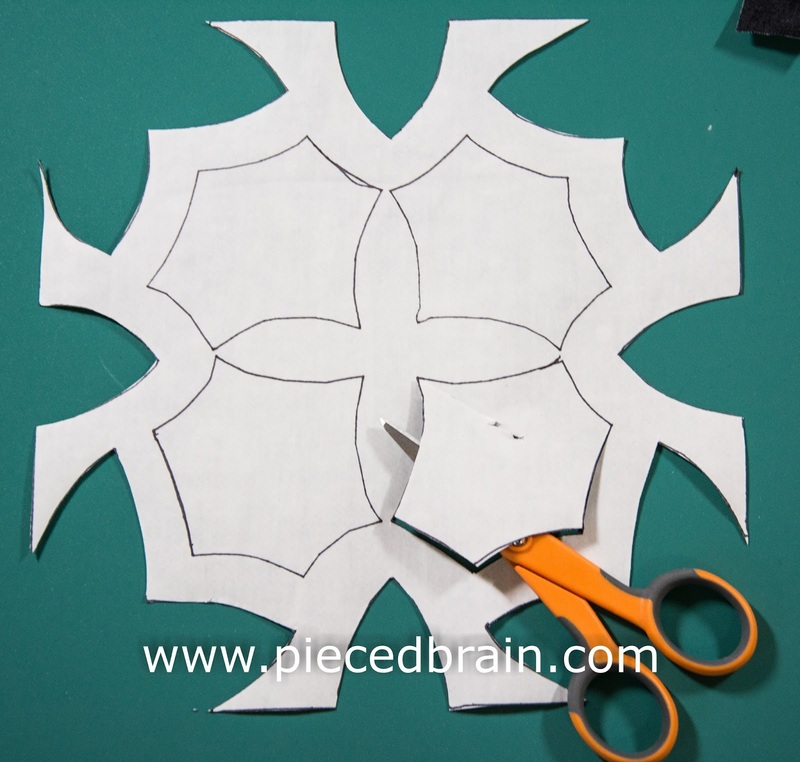 Cut around fused template, then using your small, sharp scissors (I love this one by Fiskars) cut carefully around the traced lines. If your lines weren't perfect (mine never are), here is your chance to smooth them out. This is what the 'lead' for the stained glass window should look like. 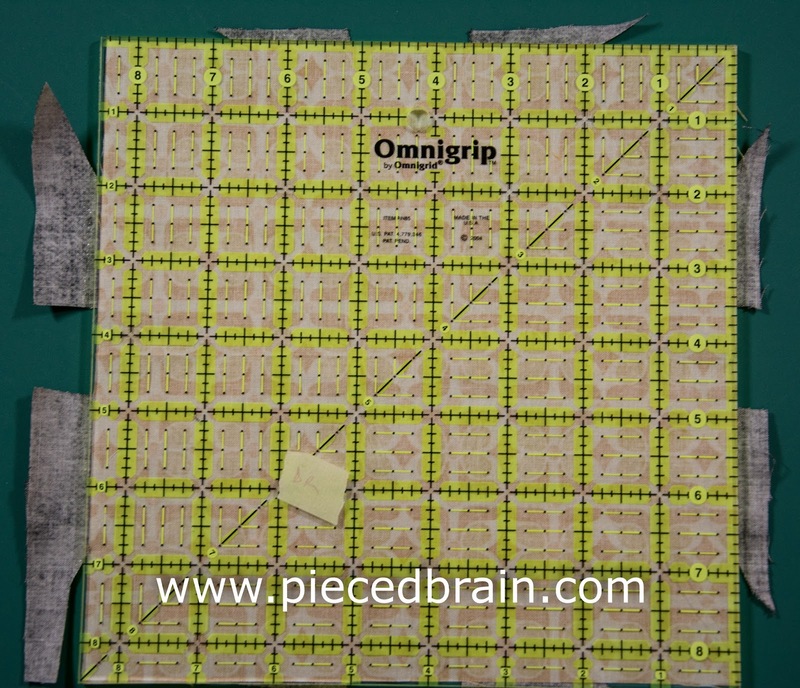 Grab a pin, flip your window design over, run pin over paper (do not go through fabric) to rip it. Now, it will be easier to pull it away from the fabric. 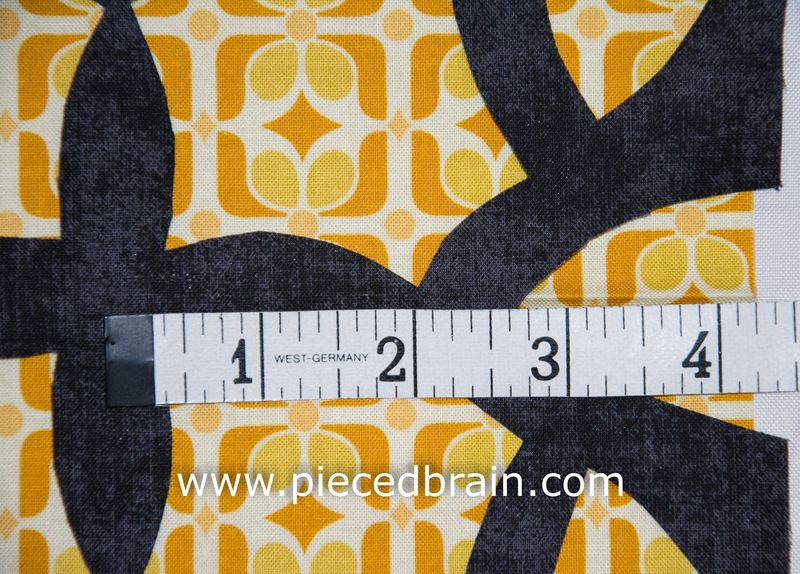 Next, fold background fabric square in half, then in half again, to crease it so you can find its center. Place stained glass 'lead' over square, centering it. Above you will notice that there was 4.5" from center of block to its edge (I cut this background square exactly 8-1/2" x 8-1/2" - good luck when stitching it to other blocks, right?). Just make sure it is centered. Notice also that the 'lead' is sticking out beyond block size. You will trim this once it is fused. Now, flip block with right side facing up and, using an 8-1/2" x 8-1/2" ruler (or any ruler), square the block. 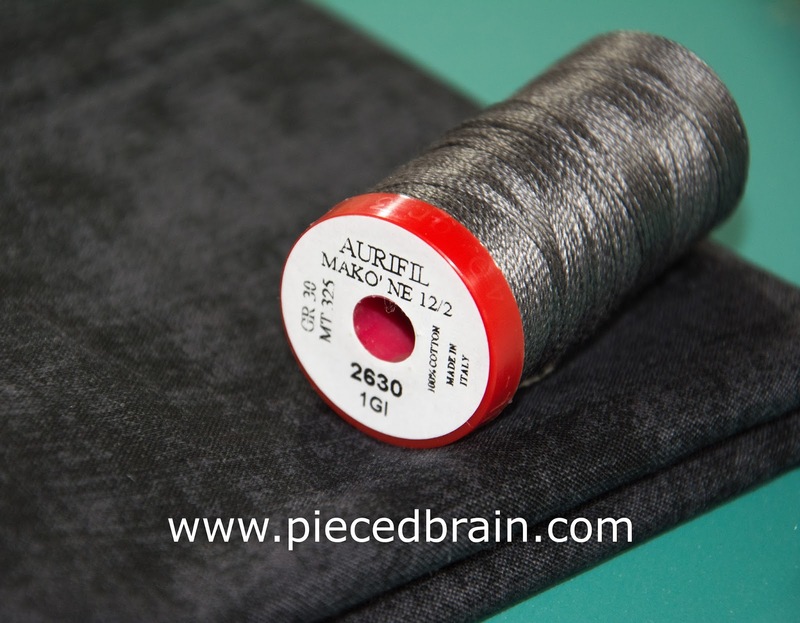 This is the thread I used: Aurifil Mako 12/2 wt. 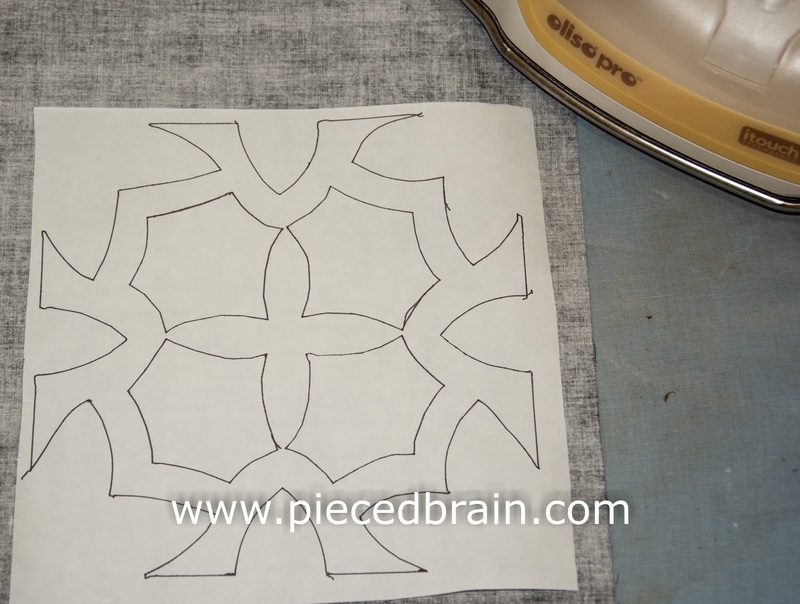 The applique looks gorgeous, and the 'lead' will look perfect! (Aurifil recommends using 50wt in the bobbin). 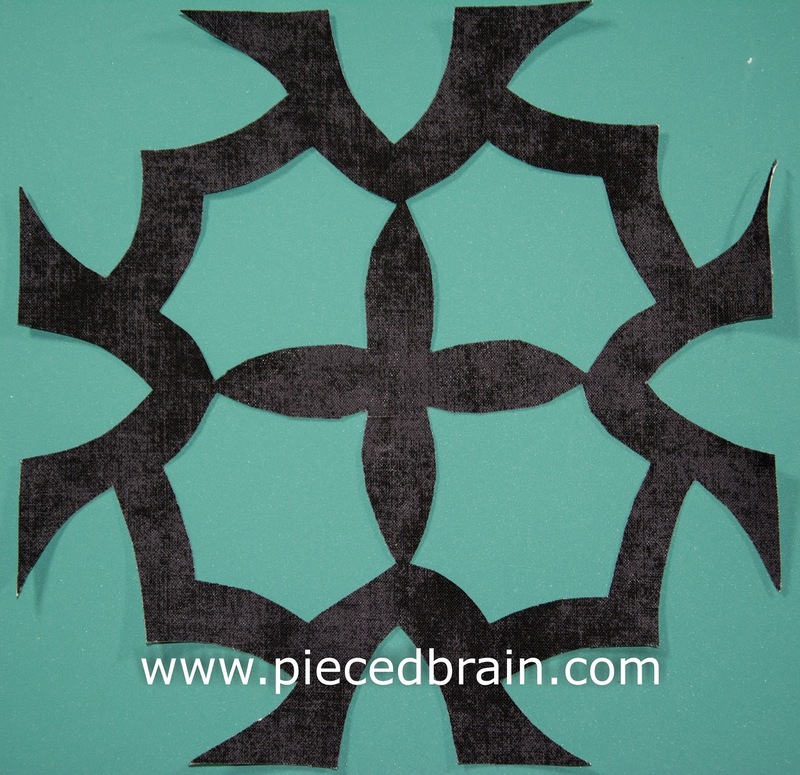 Applique using blanket stitch. 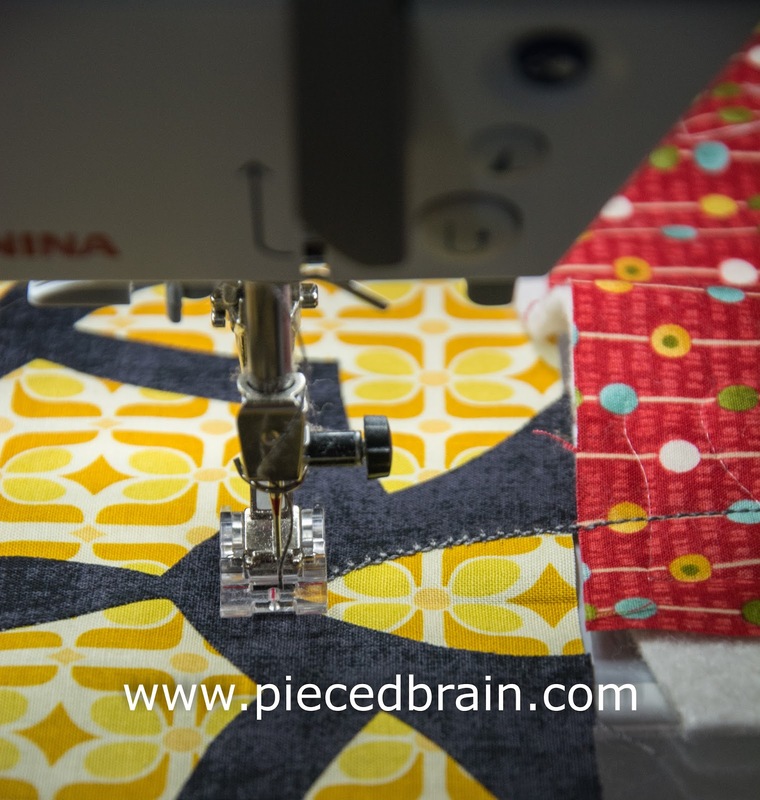 Since you will be stitching at the edge of the block, it helps to start stitching first onto a scrap of sandwich - thread won't bunch up underneath and there will be no risk of messing up the block. 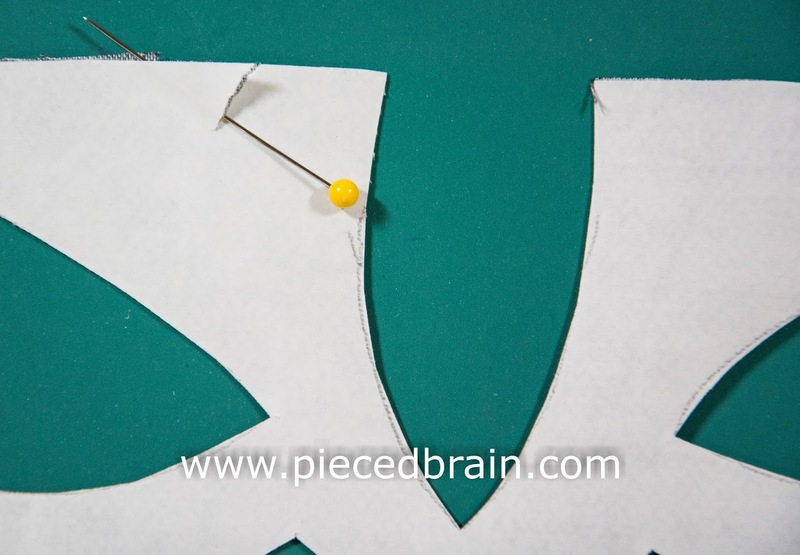 For the applique stitches to look nice, the red line should be just a thread to the left of the edge of the applique piece. 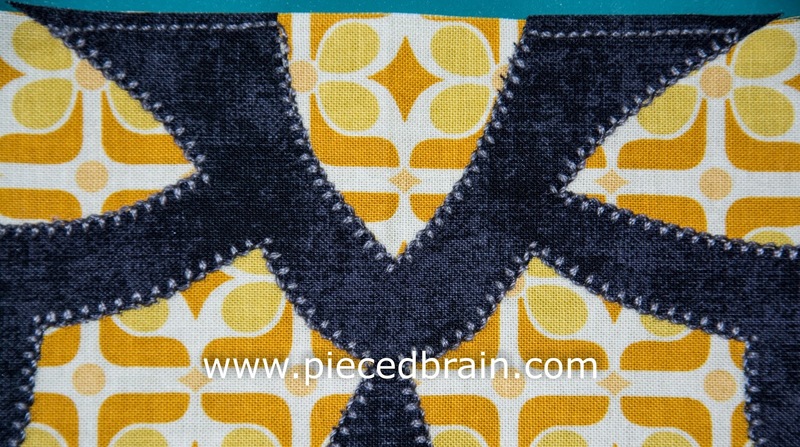 However, since I was using a heavier thread, I have it 'two threads' to the left of the applique edge! How do you like it! I love it! And, this is the second block of our City Girl Sew Along. Let me know how you like it! Hmmm, I just might have to sew along! Looks pretty interesting! Hope you have a fund earful day. Neat block! Hope I have time to make it soon. It looks so ornate! Really nice (and perfect fabric choice for the 'leading' too). This is such an awesome block! Great contrast and visual impact. This is an interesting block. I'm about to do my first applique project and was thinking I'll use a blanket stitch, would you expect there to be any fraying when you wash this?